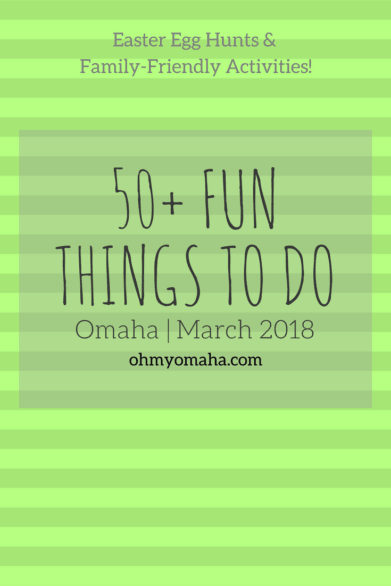 Here’s a list of March activities including family-friendly events like the St. Patrick’s Day Parade and the Easter Extravaganza at Lauritzen Gardens. 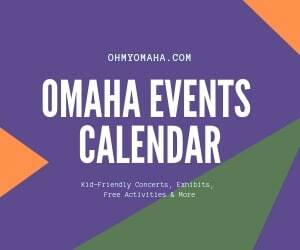 Read on for a list of Omaha events that include kid-friendly performances, FREE activities, and Easter egg hunts. Know an event or Easter egg hunt to add? Please leave a comment or email ohmyomaha (at) gmail.com. Thanks! When: March 1, 7:30 p.m. When: March 2, 5 to 8 p.m. When: March 2, 5 to 7 p.m.
Where: Union Pacific Railroad Museum, 200 Pearl St. When: March 2, 6 to 8 p.m.
Where: Omaha Public Library W. Dale Clark branch, 215 S. 15th St. When: March 2 and April 6, 6 to 10 p.m.
Where: Maple Street YMCA, 7502 Maple St. When: March 2, 6:30 p.m.
person at the box office starting at 4 p.m. the day of the show. When: March 2 and 3, 8 p.m. When: March 3, 10 a.m. to 2 p.m. When: March 3, 17 and 31, 11 a.m. 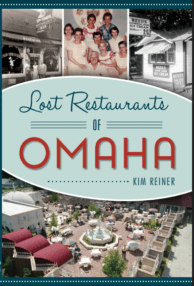 When: March 3, 1:30 to 2:30 p.m.
Where: Gretna Public Library, 736 South St. When: March 3, 4 to 9 p.m.
Where: Burke High School, 12200 Burke St. Cost: $30, adult non-members, $20 adult members; $10 children (10 and younger). Cost includes dinner. Where: Firefighter’s Union Hall, 5005 Grover St. When: March 7, 10:30 a.m. When: March 8, 4:30 to 5:30 p.m. When: March 8, 7 p.m. Ticket giveaway! Win four tickets to see Siro-A here. Giveaway ends March 3, 2018. When: March 10, 10 a.m. to 4 p.m. When: March 10, noon to 2 p.m.
Where: 3223 N. 45th St. When: March 10, noon to 4 p.m. (members-only Mimosa Brunch is at 10:30 a.m. to noon); ARTalks with Artists-in-Residence + Curator-in-Residence are noon to 1 p.m., live performance is from 1 to 2 p.m., open studios and all-ages art activity with Pamela Conyers-Hinson are 2 to 4 p.m. When: March 10, 1 to 3 p.m. When: March 10, 6 to 9 p.m. When: March 10, 7:30 p.m., and March 11, 2 p.m. When: March 14, 10:30 to 11:30 a.m. When: March 14 and 15, 7:30 p.m. When: March 15, 1 to 2:30 p.m. When: March 16, 2 to 3 p.m. When: March 16, 6 to 8 p.m. When: March 16, 7:30 p.m. When: March 17, 9 a.m. to 5 p.m. When: March 17, 11 a.m. to 1 p.m. When: March 19 and 20, noon to 4 p.m. When: March 20, 4:30 to 5:30 p.m.
Where: Maple Street YMCA gymnasium, 7502 Maple St. When: March 23, 10:30 a.m.
Where: Benson Park Goodwill, 4805 N. 72nd St. Cost: $20 each, Rose members receive four free tickets. Discount ticket vouchers are available for $16 at area Hy-Vee stores. Where: CenturyLink Center Omaha, 455 N. 10th St. When: March 24 and 31, 8 to 9:30 a.m. Cost: Member cost is $25 for children and $20 for adults. Non-member cost is $30 for children and $25 for adults. Child ticket price includes egg hunt and early pass to Children’s Adventure Trails before the zoo opens. Include a full breakfast. When: March 24, 10 to 11 a.m. When: March 24, 10 to 11:30 a.m.
Where: Ramble Ridge Park, 11424 Fort St.
Where: Lakewood Villages Park, 12001 Timberridge Drive, Bellevue, Neb. When: March 24, noon to 2 p.m.
Where: The Colonial Apartment Homes, 3022 ½ N. 97th St.
Where: Miller Park Pavilion, 2707 Redick Ave.
Where: Montclair Community Center, 2304 S. 135th Ave.
Where: Marcus Twin Creek Cinema, 3909 Raynor Parkway, Bellevue, Neb. Where: Dundee Presbyterian Church, 5312 Underwood Ave.
Where: St. Paul Lutheran Church, 5020 Grand Ave. When: March 31, 11 a.m. to 1 p.m.
Where: Christ the King Catholic Church/School, 654 S. 86th St. When: March 31, 1 to 4 p.m. When: March 31, 2 and 6 p.m.
Where: Strategic Air Command and Aerospace Museum, 28210 W. Park Highway, Ashland, Neb. When: No end date yet; hours are Mondays through Fridays, 9 a.m. to 3 p.m.
Where: MCC North Express at the Accelerator Building (third floor), 5300 N. 30th St. I love these monthly posts! I’m always scouting the internet for things to do with my 2 and 4 year old! Thanks! I hope you’ve found some great things to do with these lists.